CLEANER: Formulated to keep small and large caliber weapons preforming in the harshest conditions. Exceeds U.S. Government CLP military specifications, approved for use in extreme environments including cold, salt, and dust. LUBRICANT: Helps weapons perform continuously at maximum firing rate without incident. Proven in extreme conditions with a fire rate of 650 rounds/min with zero stoppages. PRESERVATIVE: Trusted by the U.S. Military and approved by the U.S. Government to keep their weapons battle ready. 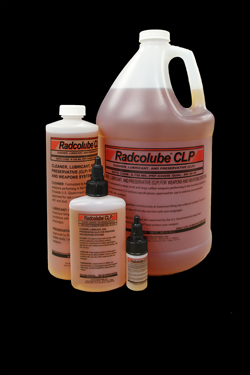 Let RADCOLUBE CLP (GUN OIL) help protect your weapon.